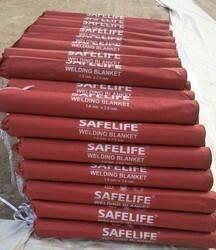 Providing you the best range of welding blankets with effective & timely delivery. Our Welding Blankets provide protection from sparks, spatter and slag generated by welding or metal-cutting applications. Our blankets are made to size from a variety of heat-resistant materials. Wilson continues to search for asbestos replacements by pioneering the use of the latest fiberglass fabrics. Packaging Details: Available sizes are 1mtr x 1mtr, 4mtr x 1mtr, 1mtr x 2mtr, 4mtr x 2mtr, 2mtr x 1mtr, 2mtr x 2mtr.